Another week, another Tomb Raider editorial. Seeing as how this game remains in discussion, I’m taking time from playing Bioshock Infinite to address a few things I’ve been reading regarding Crystal Dynamic’s reboot. Let me get some of my history with Tomb Raider out of the way. I’ve played every single game in the series that has been available on consoles. Every. Single. One. That includes The Last Revelation and the much-maligned Angel of Darkness. I would also like to disclose that I have enjoyed every single one of them. Every. Single. One. Some more than others, but I have never not enjoyed a Tomb Raider game. My reason for explaining this is simple: what I am about to say is going to be incredibly controversial in terms of drawing Internet ire. The new Tomb Raider is the best game in the series since Tomb Raider 2 and it’s better than the original. There, I said it. Now I would like to explain why I feel this way and in the meantime, hopefully address some of the issues I’ve been reading about when this game is in discussion. First of all, the game is drop-dead gorgeous – from the lush locations, to the decaying nature of the man-made environments, to Lara’s character animations, they are all unrivaled on a console. Now, before you say, “But, Uncharted…” yes, Uncharted has the same elements and is also gorgeous, but unlike Uncharted, the environments in Tomb Raider are expansive, have a jaw-dropping verticality and are staggeringly seamless. Second of all, the game is purely fun to play. I don’t know about you, but I would say that 90% of the reason why I play video games is because they’re fun. Yes, I like to be challenged, but challenge doesn’t always equate to fun. Much like the Uncharted series, the new Tomb Raider is a far more cinematic adventure akin to a summer movie blockbuster and is briskly paced with very few instances of the momentum breaking that often halts other puzzle focused games, like the original Tomb Raider. Tombs consist of little more than one realistic, physics based puzzle. And it’s in the puzzles, or lack thereof, where the first signs of contention seem to be. There are very few “traditional” tombs in Tomb Raider and that can be disappointing if a player went in expecting a, well, traditional Tomb Raider game. Here is the caveat though. 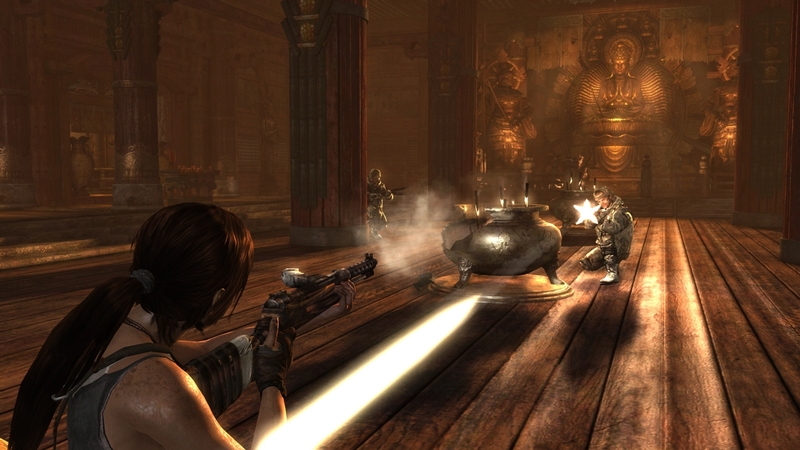 This Tomb Raider has always been shown and discussed as a “reboot” – the remake came several years ago in 2007’s Tomb Raider: Anniversary. A reboot, by definition, is to “restart.” In entertainment, a reboot means to disregard all established continuity in the respective medium and to “restart” from the beginning. In short, the reboot of Tomb Raider is a do over for the franchise. And while many fans might say or think that the series didn’t need a reboot, the last game barely reached 2 million in sales, and unfortunately, that’s a far cry from the reported 8 million copies the original sold. Seeing the character Lara Croft and the name Tomb Raider as still commercially viable, Crystal Dynamics decided to reboot the series and start fresh. A redesign of not only the character but the very definition of what the series is. In terms of gameplay, the new Tomb Raider doesn’t have the “traditional” tombs in which the entire level is one giant puzzle to be navigated with plausibility stretching, Rube Goldberg-like puzzles that could take an hour to complete. 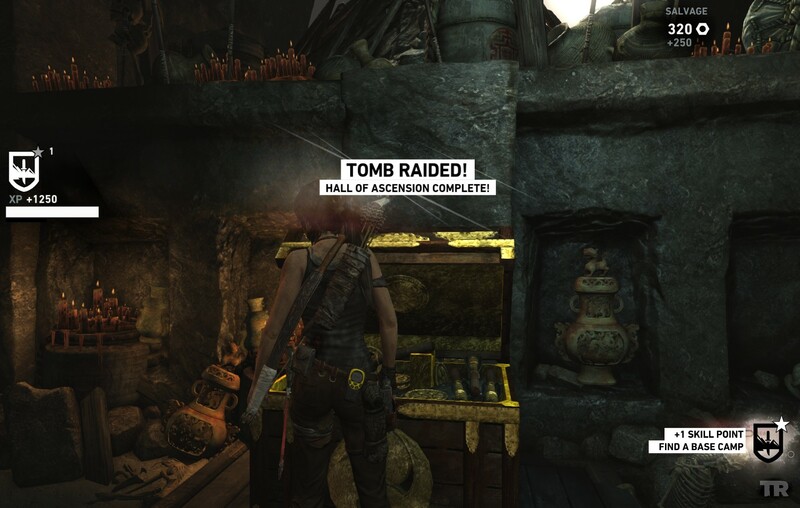 Crystal Dynamics made the entire island of Yamatai the tomb and the puzzles were more of the navigational variety. This is surely a disappointment to some, but for me, I appreciated the approach as it lent itself to the story and the narrative flow of the game. If I’m being honest, none of the stories in the Tomb Raider series have been particularly great, so hour-long diversions into tombs just to open a door worked on a gameplay level, but never narratively. As video games have become more sophisticated and more like film so too have their narratives. As a huge fan of cinema, I appreciate this. Especially when it’s done well. The story in Tomb Raider is well told and features a very clear arc for Lara as a character which is something most games do not do or even attempt to. This arc is serviced by the pacing of the game and by making the island one giant navigational puzzle. By making the tombs optional, it allows the game’s narrative to progress at the pace the storytellers want it to. With all of that being said, I would like to see them make the tombs in the sequel much more complex. Keep them optional if need be, but the seeds are there for very realistic, plausible puzzles that can be much deeper and more rewarding. Another target of the negative criticism is the combat – or rather the frequency of it. First I would like to address the quality of the combat. Combat has never been very good in the Tomb Raider series but for the reboot, Crystal Dynamics not only managed to make the gunplay fun, they also iterated on the very concept of third person, cover based shooting. No longer requiring the push of a button to stick to cover, the game intuitively crouched Lara and placed her behind cover when combat scenarios drew near. Allowing freer movement for the player and keeping the focus on the task at hand: surviving. For me, the frequency makes sense both from a design perspective as well as a narrative one. While we all would like to the think games are made solely for us, they aren’t. The thing we enjoyed quietly in our homes growing up, the thing some of us used to avoid interacting with other people, the thing we used to escape from the real world, has become mainstream and hugely successful. Not only that, as we demand better graphics and gameplay, the budget for these titles has increased exponentially. The bottom line is that our hobby is a business. A lot of the franchises we love exist because the preceding game made enough money to warrant the expenditure for a sequel. As such, shooters are arguably the most successful genre this generation. It stands to reason that in order to increase the units sold for Tomb Raider, Crystal Dynamics would attempt to broaden their audience as much as possible by including, and ultimately emphasizing the combat in the game. When you take into account that none of Crystal Dynamics’s previous games involved cover based shooting and that it turned out so exceptional is no small feat. Combat is never boring, and is incredibly well done. While I can understand the disappointment regarding how the game is not like the Tomb Raider of yesteryear, allow me to put it into some perspective. In 2005, a relatively unknown director with 2 indie films and one moderately successful remake undertook a reboot for a once popular and successful franchise. The reboot was a critical and commercial success, so much so that most people see them as the definitive version of the franchise. The filmmaker was Christopher Nolan and the film was Batman Begins. Hard to believe, but there are still people who prefer Tim Burton’s version. While all or even some of this may not sit well with a segment of the fan base, clearly Crystal Dynamics has done something right as it’s been well documented that the new combat focused, streamlined Tomb Raider has been a huge success both critically and commercially – with the game scoring a great 86% average on Metacritic and selling 3.4 million units in less than 4 weeks (despite Square Enix’s expectations). The future is bright for Tomb Raider and personally I can’t wait for the next Lara Croft adventure. Square Enix Part 2: How the West Was Lost? A console gamer’s defense of a consolized piece of dreck.